This item is not currently sold. If you want the best performance from your optics, they need to be properly maintained. 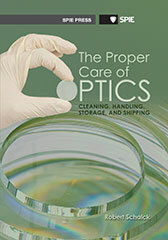 This book describes the cleaning, handling, and storage methods used by professional technicians to keep optics in top condition. It is written for a diverse audience, from first-time optical cleaners to assembly technicians and seasoned engineers looking to expand their repertoire. In the lab or in the field, you'll find the right technique to protect your equipment from harm. Reference lists of tools, solvents, and suppliers are provided to help you find solutions quickly. Of all the human senses, sight is the dominant one. The human brain receives most of its information in the form of visual stimulus, and optics plays an important role in delivering that information. Take, for example, a person using a digital camera to shoot a picture of the Grand Canyon. A person's eyes perceive the scene first, possibly while wearing eyeglasses, contacts, or sunglasses. Photons (light) from the sun are reflected or absorbed by the pigments in the canyon walls. The photons hit the first surface of the camera lens and are then refracted several times by the internal optical lenses. The collections of photons are focused on the surface of the imaging chip and stored, to be retrieved by a computer or printed onto paper. On the computer, the image is displayed on a screen, observed, and adjusted. The image is then sent to a device to be printed or projected using internal optics. Fiber optic cables send the image electronically. * Digital projectors are used for meetings, computer screens display information, stage lighting in theaters use Fresnel lenses, and a microscope allows us to view microbes. This book describes the cleaning, handling, and storage methods used by professional technicians and engineers to maintain optics. It is written for a diverse audience, from a first-time optical cleaner to a seasoned engineer who is looking for an old optical trick used many years ago. There are many ways to clean optics; some are learned from experience and/or failure. A few people will discover that these methods may differ from what they learned and question them. How to clean optics has always been a challenging and controversial subject. Searching the Internet will yield hundreds of articles and videos that claim to know the best methods. Cleaning methods have improved since the 1960s with the start of the manufacturing of critical optics for aerospace applications and lasers. Surface quality specifications became tighter, and a so-called "commercial type finish" is no longer the norm. It is now common to have specifications for scratch and dig ranging from 40-20 to 10-5. Practically all particles must be removed to avoid interference with the image quality or the possibility of damage to critical electronics. Even partial monolayers of real contaminants can compromise coating performance and adherence. Newer materials and methods were developed to meet these new demands.